How can I get started using Thyng? You can get started with Thyng by downloading our app from the Apple App Store or the Android Google Play Store. Thyng>targets is available for all users. Thyng>surfaces is available to users with iOS11 and a ARKit compatible iOS device. What is the difference between Thyng>surfaces and Thyng>targets? Thyng 4.0 is unique in its support for both surface-based AR and target-based AR. 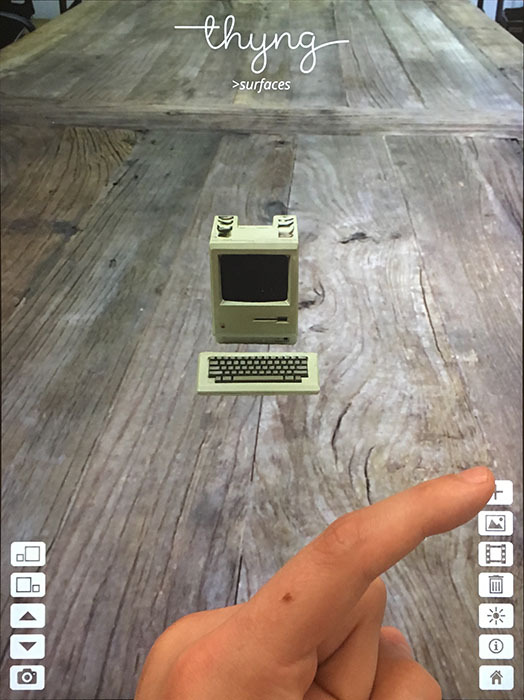 Surface-based AR allows virtual items like photos, videos, and 3D objects to be placed onto any surface in the real world, like a table, a counter top, or a floor. Target-based AR provides the ability to scan a specific product, logo, or image to trigger a Thyng Augmented Reality experience overlaid onto the real-world item. For example, a cereal box can be scanned, resulting in a “Buy Now” button being displayed that allows a consumer to actually purchase the product. What do each of the authoring buttons do on the Thyng>surfaces interface? In Thyng>surface mode point at any surface and watch the green surface lock become a complete square. Now you are ready to place objects. What if my green surface indicator does not appear in Thyng>surfaces? In Thyng>surface mode, when you point at any surface, the green surface indicator should appear within a few seconds – it will initially appear as four green corners of a square. If you are running Thyng for the first time and viewing your first surface, and the green surface indicator does not appear within about 15 seconds, then try and view another surface – if the green surface indicator still does not appear after about 15 seconds, then please restart your device and re-launch the Thyng app – after restarting your device, the green surface indicator should appear right away! (Please note that if you have already seen the green surface indicator during a Thyng session, and have already placed objects onto a surface, then the green surface indicator will no longer appear for that surface – this is normal behavior – once you have started using a surface, you can continue to use it and place objects on it without seeing the green surface indicator for that surface). How do I add 3D Objects onto a surface? Tap the Plus (+) button to add an object onto the surface. How do I add my own photos onto a surface? Tap the Photo button to add your own photos to your scene. How do I add my own videos onto a surface? Tap the Video button to add your own videos to your scene. Can I add my own 3D Objects onto a surface? 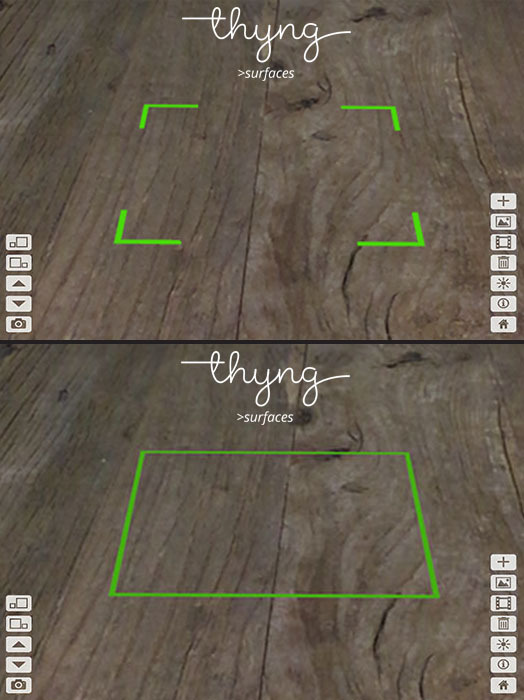 Yes, you can add your own 3D Objects using My Thyngs. Head over to My Thyngs for a quick guide and you will have your object up in no time! Can I save my Augmented Reality scene? Fear not, the ability to save your Augmented Reality scene is arriving in a future version of Thyng! How can I reset my Augmented Reality scene? 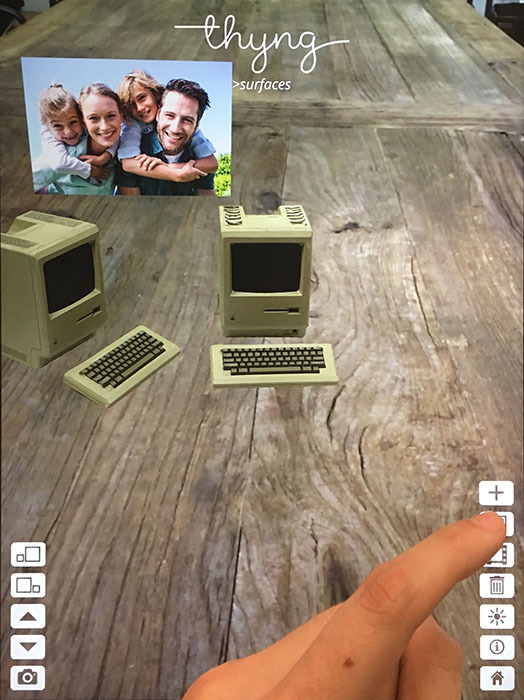 You can reset your augmented reality scene by tapping the home button and then re-entering surface mode. 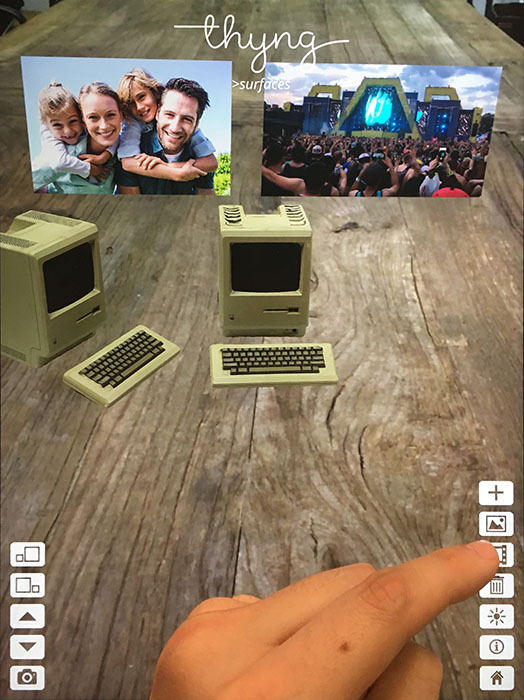 How can I take Photos of my Augmented Reality scenes? Tap the Camera button to snap a photo of your scene. Surface worlds are ephemeral for now (they exist while you’re in them), so take lots of pictures! How can I take Videos of my Augmented Reality scenes? You can take a video of your Augmented Reality scene by using the iOS11 screen recording functionality. Here is a quick tutorial on how to add screen recording to your iOS11 control center. How can I share my Augmented Reality scenes with others? 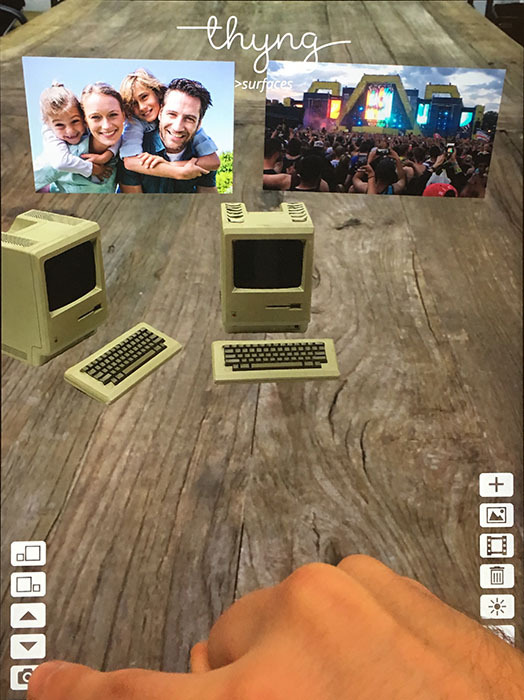 You can share your Augmented Reality scenes with others by snapping a photo with the camera button and then using your favorite photo sharing medium (Text Message, Facebook, Twitter, Instagram, etc!). How do I select an object to perform an operation on it? To perform an operation on an object, touch the object and then tap the button of the operation you wish to perform. Operations will apply to the object that was most recently modified. How do I add light sources into the scene? You can add a light source into the scene by tapping the add light source button. How do I make objects larger or smaller? To increase the size up an object press the scale up or scale down buttons. How much does Thyng cost? If I press the iPhone Home Button, or switch to another app, will I keep my scene? Yes, your scene will still be saved. However, please be aware the positioning of your objects may be slightly altered.